The List of Monarchs of Korea provides a insightful look at the development of Korea since its legendary founding in 2333 B.C.E. until the end of the last royal dynasty in 1910 C.E. If, indeed, the history of Korea has been continual from those legendary beginnings, Korea has experienced one of the longest continual dynastic developments in history. We have clear evidence that Koreans are the most homogeneous people on the earth, so we can well expect that their history has been unbroken. Rather than a linear development of one dynasty succeeding another, Korean history from 2333 B.C.E. until the beginning of the Goryeo dynasty in the 930s, over 3000 years, had been kingdoms coexisting yet clashing for dominance. From the 930s to 1910, nearly 1000 years, Korea experienced a single dynasty ruling the entire Korean Peninsula. The following list of monarchs has been categorized by historical era beginning with the most ancient and concluding with the most recent. Monarchs' names are listed either romanized posthumous (according to the South Korean Revised Romanization of Korean) or temple names along with the dates of their reign. Articles about the individual monarchs include the McCune-Reischauer romanizations. The legendary Dangun founded the first kingdom, Gojoseon (c.2333 B.C.E. - 108 B.C.E.) in 2333 B.C.E., although historians debate the founding years. Gojoseon may have numbered among the small peninsular states which emerged "by the fourth century B.C.E." Lee mentions Gojoseon emerged in the Liao and Taedong valleys by the fourth century. Some, like Kim regard "Dangun Joseon" as having possibly existed during the Neolithic period, i.e. before the thirteenth century B.C.E. ; by the same token they reject the possibility that Gojoseon existed as a "state" or even "tribal confederation" in the modern sense. Professor Yoon writes that the Gojoseon had become an ancient nation at 2333 B.C.E. which is the most recent research. Bronze age archaeological evidence of Gojoseon culture has been found in northern Korea and southern Manchuria. By the fourth century B.C.E., historical and archaeological evidence supports that Gojoseon flourished as a kingdom. Gyuwon Sahwa (1675) describes The Annals of the Danguns as a collection of nationalistic legends. Scholars widely question the authenticity of the Hwandan Gogi that lists different years of reign. See also List of legendary monarchs of Korea. Many scholars believe that Gija-Joseon succeeded Dangun Joseon, but some scholars debate the claim. The successor-state of GojoseonWiman Joseon (194 - 108 B.C.E.) began with Wiman's seizure of the throne from Gija Joseon's King Jun and ended with the death of King Ugeo, a grandson of Wiman. Unknown (161 B.C.E. - 129 B.C.E. ), son of Wiman. Ugeo of Gojoseon (Hangul: 우거왕 Hanja: 右渠王) (129B.C.E. - 108 B.C.E. ), grandson of Wiman. Bukbuyeo (c.239 B.C.E. - 58 B.C.E.) ruled in modern-day Manchuria. The rulers continued to use the titles of Dangun. Some records refer to Bukbuyeo (North Buyeo) and Dongbuyeo (East Buyeo). In 37 B.C.E., Go Jumong, a great-grandson of Haemosu Dangun's second son, entered Jolbon Buyeo, Bukbuyeo under a changed state name. Jolbon's ruler, Go Museo, died with no sons and had declared Jumong successor. Thus, Jumong rose to the throne of Bukbuyeo and changed the state's name to Goguryeo. The rulers of Dongbuyeo submitted to Bukbuyeo in 86 B.C.E., and thus used the title Wang ("King"). King Haeburu, the brother of Go Uru Dangun, originally succeeded his brother to the Bukbuyeo throne. The forces of the Han dynasty and the rising of Go Dumak chased King Haeburu, a descendant of Goyeolga Dangun, the last ruler of Gojoseon, to the east. Scholars dispute the Jin (Mahan) Confederation genealogy. Goguryeo (37 B.C.E. - 668 C.E.) existed as one of the Three Kingdoms of Korea. Goguryeo rulers used the title of Taewang (太王, "Greatest King"). The founder of Goguryeo, considered the 7th Dangun of Bukbuyeo, succeeded the 6th Dangun Gomuseo to the throne of Jolbon Buyeo or Bukbuyeo under a different name. 1 Dongmyeong 동명성왕 (東明聖王), 동명왕 (東明王) Jumong 주몽 (朱蒙), Chumo 추모 (鄒牟), Sanghae 상해 (象解) 37 B.C.E.-19 B.C.E. 2 Yuri 유리왕 (琉璃王), 유리명왕 (琉璃明王) Yuri 유리 (琉璃, 類利), Yuryu 유류 (孺留), Nuri 누리 (累利) 19 B.C.E.-18 C.E. Notes:  Some of Goguryeo's records of individual kings, especially of the 19th (Gwanggaeto), use the title "Taewang" or "Hotaewang," roughly meaning Greatest King or Very Greatest King. Some argue that the for the translation "Emperior," equivalent of the Chinese title 皇帝, but few accept that. The most complete and oldest existing Korean history text, the Samguk Sagi and the Samguk Yusa, written centuries after Goguryeo was defeated, uses the title "Wang," meaning King. The kings' names generally derive from the location of the king's burial, often differing with the Chinese concept of 諡號. Goguryeo kings had the surname Go, except for the second (Yuri) through fifth (Mobon), who have Hae as surname. According to records, all of the kings belong to the same patrilineal bloodline. Debate continues among scholars about whether the two surnames represent different transcriptions of the same name, or provide evidence of a power struggle. The Samguk Sagi and Samguk Yusa, mention "other names," "birth names," "childhood names," or "personal names." The Samguk Sagi provide the Legendary line names and dates. The Wei shu (History of the Wei dynasty) gives the following names: 朱蒙 Jumong (Zhūméng}, 閭達 Lǘdá, 始閭諧 Shǐlǘxié, 如栗 Rúlí, and 莫來 Mòlái. The legendary line had already been formed with some variants in the early fifth century when Emperor Jangsu built a monument for his father and Goguryeo made contacts with the Northern Wei. The inscription of that monument gives these names: 鄒牟 Chumo, 儒留 Yuryu, and 大朱留 Daejuryu. The connection between those names remains unclear. Baekje (18 B.C.E. - AD 660) belonged to the Three Kingdoms of Korea. Temple names equal personal names, unless noted otherwise. Silla (57 B.C.E. - 935 C.E.) constituted one of the Three Kingdoms of Korea. In the early years, the Pak, Seok, and Kim families ruled Silla. Rulers of Silla had various titles, including Isageum, Maripgan, Taewang, Daewang and Yeowang. Like some Baekje kings, some declared themselves emperor. Gaya confederacy (42 - 532) consisted of several small statelets. All rulers of Gaya bore the title Wang ("King"). According to a legend recorded in the Samguk Yusa (a collection of folktales, legends, and biographies from early Korean history), in the year 42 C.E., six eggs descended from the heaven with messages that they would be kings. From the six eggs came six boys and within twelve days the boys grew to maturity. One of them, named Suro, became the king of Geumgwan Gaya, and the other five founded the other five Gayas, namely, Daegaya, Seongsan Gaya, Ara Gaya, Goryeong Gaya, and Sogaya. This list is of the Kim Dynasty of Geumgwan Gaya (42-532). Given the legend that records the the founding of Geumgwan Gaya in 42 C.E. when six eggs descended from heaven, the period of Suro's reign (42-199) should not be taken to imply that he was a single historical person who lived for over 150 years. Only four of the sixteen kings of Daegaya (42 - 562) are known by name. ?. King Haji of Daegaya 하지왕, generation unknown; possibly also known as King Gasil; sent emissary to 南齊 China in 479, joined Baekje to aid Silla from Goguryeo attack in 481. Balhae (669-926) followed Goguryeo in the northern territories when Silla unified half of the Korean Peninsula. The founder called the state Jin, claiming the title of the successor to Goguryeo, but after establishing relations with China Jin received the name Balhae (Bohai in Chinese). The rulers used the title Daewang ("king") and had the temple name of either -jo or -jong, though deposed rulers accounted for an exception. Later Balhae (927-936), the first successor-state of Balhae, rose almost immediately after its fall. The founder, Dae Gwang Hyun, a member of the royal family and possibly a prince, used his position and lineage to legitimize his rule of Balhae. Dae Won lost hold of his regime, when his general, Yeol Manhwa, staged a successful coup. Yeol Manhwa formed the Jeong-An Kingdom, reviving Balhae. Dae Yeon-Rim—a seventh generation descendant of Dae Joyeong, the founder of Balhae—founded the Heung-Yo Kingdom (1029-1030). The Heung-Yo Kingdom, among the last of the successor-states of Balhae, fell within a year to Liao forces in 1030 C.E. The Dae Won Kingdom (1116) represented the last major successor-state and attempt to revive of Balhae. Go Yeong-Chang, a descendant of the Goguryeon Royal family, founded the Dae Won Kingdom. The Dae Won Kingdom fell within the year of its establishment. Yi Jeonggi founded the State of Je (765 - 819), a successor-state of Goguryeo. The son of a Goguryeo captive in the Tang Empire, Yi Jeonggi gathered a massive army that consisted of both Goguryeo and Baekje soldiers. In 765, Yi rebelled and established the Je kingdom, declaring himself the "Emperor of Je." Yi conquered fifteen prefectures of Tang Empire, gathering the people of Goguryeo and Baekje into one cause and nation. The State of Je attacked the Tang capital of Changan several times before falling to the Tang-Silla Alliance in 819. Yi Jeonggi (Hangul : 이정기 Hanja/Hanzi :李正己/李定己) 765C.E. - 781C.E. Yi Nab (Hangul : 이납 Hanja/Hanzi :李納) 781C.E. - 793 C.E. Yi Sago (Hangul : 이사고 Hanja/Hanzi :李師古) 793C.E. - 807C.E. Yi Sado (Hangul : 이사도 Hanja/Hanzi :李師道) 807C.E. - 819 C.E. The Wang Dynasty ruled Goryeo (918-1392). 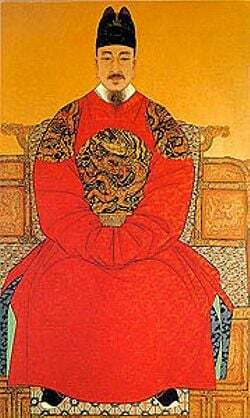 The first king had the temple name Taejo, meaning "great progenitor," a title applied to the first kings of both Goryeo and Joseon, also the founders of the Wang and Yi Dynasties respectively. Joseon (1391–1897) followed Goryeo. In 1897, when Joseon became the Korean Empire, Emperor Gojong posthumously raised some of the Joseon kings to the rank of emperors. Joseon monarchs had temple names ending in jo or jong. The first kings/emperors of new lines within the dynasty received the title Jo, with the first king/emperor having the special name (Taejo), which means "great progenitor" (see also Goryeo). All other kings/emperors received the title Jong. Kings Yeonsangun and Gwanghaegun received their normal titles, without temple names, after their reigns ended. Each monarch had a posthumous name that included either the title Wang ("King"), Hwangje ("Emperor"), Daewang ("King X the Great"), or Daeje ("Emperor X the Great"). For the sake of consistency, the title "King/Emperor" has been added to each monarch's temple name in the list below. King Gojong declared the Korean Empire (1897-1919) to declare the end of the tributary relationship with China. Technically, historians use the emperors' era names rather than their temple names to designate the king, but commonly use temple names. ↑ Bruce Cumings, Korea's place in the sun: a modern history (New York: W.W. Norton, 1997, ISBN 978-0393040111), 25. ↑ Ki-baek Yi, A New History of Korea (Cambridge, MA: Published for the Harvard-Yenching Institute by Harvard University Press, 1984, ISBN 978-0674615755), 13. ↑ Jung Bae Kim, "Formation of the ethnic Korean nation and the emergence of its ancient kingdom states," Korean history: Discovery of its characteristics and developments (Seoul: Hollym, 1997, ISBN 1565911776), 27-36. ↑ N.-H. Yoon (윤내현), The Location and Transfer of GO-CHOSUN's Capital (고조선의 도읍 위치와 그 이동), 단군학연구, 7, 207-238, 2002. ↑ 7.0 7.1 Chʻang-guk Song, Paekche wangjo 700-yŏn. Ŭttŭm yŏksa manhwa, 4. (Sŏul-si: Kyerim Datkʻŏm, 2001, ISBN 9788981069308), 318-319. Yoon, N.-H. (윤내현), The Location and Transfer of GO-CHOSUN's Capital (고조선의 도읍 위치와 그 이동), 단군학연구, 7, 207 – 238, 2002. Department of Asian Art. "List of Rulers of Korea." In Timeline of Art History. New York: The Metropolitan Museum of Art. History of "List of monarchs of Korea"
This page was last modified on 24 July 2018, at 13:15.